This fresh summer Gazpacho reminds me of hot summers in Spain. Gazpacho is one of my favorite dishes. This Gazpacho with sweet pointed red peppers, fresh chili, scallions and basil bursts with the flavors of summer. It is so simple and easy to make and very refreshing on a hot day. This soup is ready in under five minutes. The only thing you need to do is to chop up your veggies in big chunks and throw them in a blender. I usually have it for lunch or as a starter. I enjoy it on its own or with some lovely sour-dough bread from Le Pain Quotidian. Chop up your veggies in big chunks. Add them to a high-speed blender with two of cups of water, vinegar and olive oil. Pulse until smooth. Serve with fresh basil and a drizzle of olive oil on top. 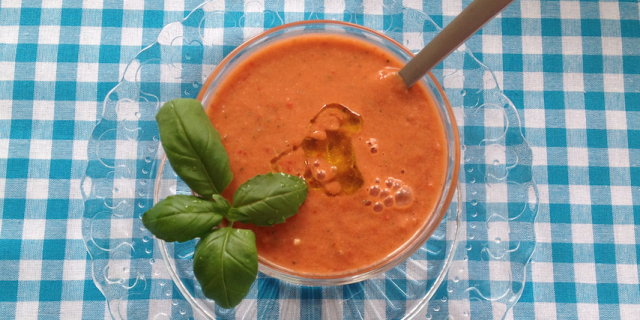 Enjoy your fresh summer gazpacho.